These are the summary points from Mike Kilner’s very enjoyable talk on October 24th about helping the meadow creatures through the winter. This was an opportunity to see three quite different meadows in a lovely village context and we are grateful to Simon Barker for his help making it possible. St Peter’s Church has about one acre that is rich in wildflowers, it is on thin, free draining sandy soil and it contains over 75 plant species. There is really very little grass and the sward does not develop a lush growth as do many hay meadows. The Churchyard is mown occasionally over the year but there are small areas that are left and the management is sympathetic to wildflowers. Near the Church we saw two small garden areas that are kept for wildflowers and are great examples of how a species rich mini-meadow will develop if allowed to. Outside the Village centre we saw a two acre field. It is grazed by horses only in the winter months and this has proved very successful as a management regime for a flowering meadow. The field faces South West and so is warm over the summer, there are nice thick hedges and some bramble patches. The field is about half a mile away along a bridleway and “stout shoes” would be advisable. Things in flower should include knapweed, lady’s bedstraw, musk mallow & mouse-eared hawkweed and, weather permitting good numbers of common grassland butterflies should be on the wing. Monday 30th June in the afternoon – walk around David Hill’s 120 acre farm near Blakeney guided by Rosie Kelsall. David Hills has 120 acres along the top of the ridge that is traditionally managed for hay or silage with grazing afterwards. 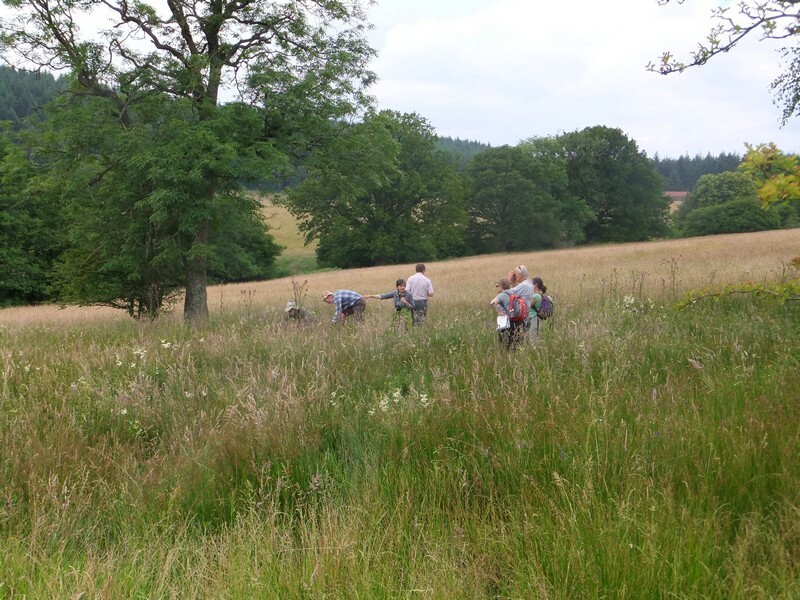 It may be the largest area of traditionally managed meadow in the Forest of Dean ( if you know of any larger please let us know ). 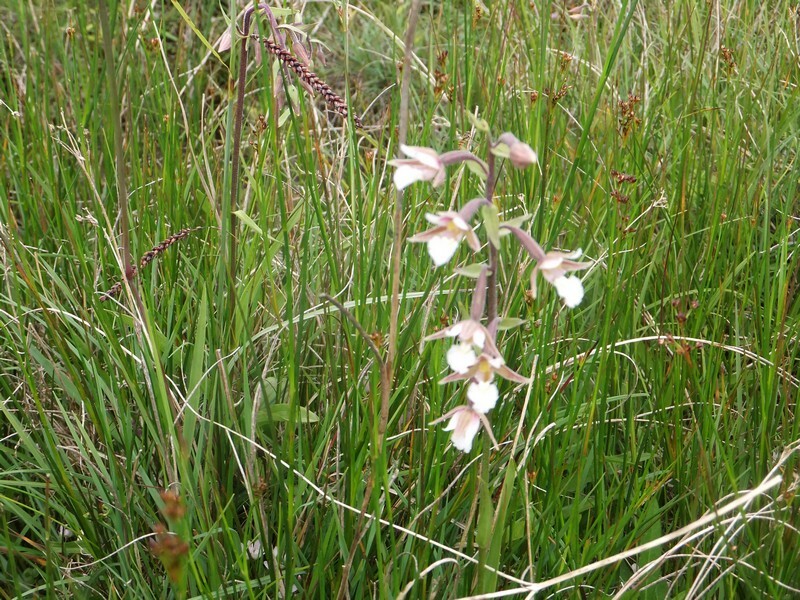 Despite being high up on a ridge there is a wet area that doesn’t get cut and this had Common Spotted Orchids, Ragged Robin, Marsh Helleborine and other interesting flora . Meeting with the Hereford Botanical Society. 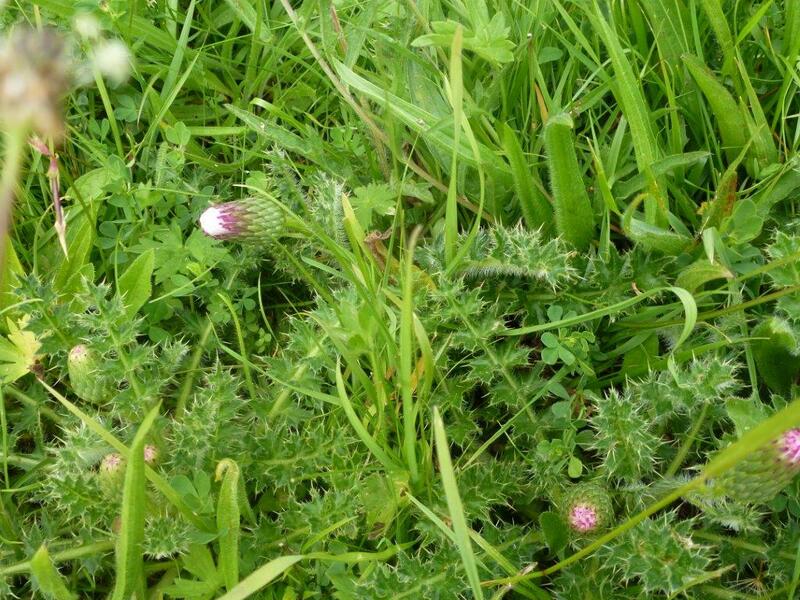 ( Species rich meadows and orchards) 12th June Meeting House, Flaxley. DMG would like to stress the value of using local seed sources ( such as from The Meeting House, Flaxley or another DMG member ). Also remember the need to remove the cuttings to reduce fertility and help seed germination. I looked up the Yellow Rattle article I mentioned (British Wildlife Vol 17, 2005). They say that in general it is a Good Thing for establishing species-rich grassland but they do make the points that it can also reduce the vigour of some non-grass species particularly legumes (notably birdsfoot trefoil) and that species it doesn’t parasitise such as ribwort plantain and various “weeds”, which people might not necessarily want to encourage, could thrive more if the rattle knocks back the grasses and various other things and thereby gives these “weeds” a competitive boost. The only negative thing they mention is a possible toxicity to livestock in hay, but this seems to be largely folklore and they reckon it would probably only start to be toxic if the animals ate nothing but rattle for a long period. So all in all it is to be encouraged. I suspect that the very high level of rattle you can get in grassland will eventually stabilise out at a more sensible level. We had our display stall and member information at the Transition Spring Fair in Cinderford on 22nd March. This was a vary successful community event and DMG concentrated on the theme of gardening for wildflowers. Tuesday 25th February. 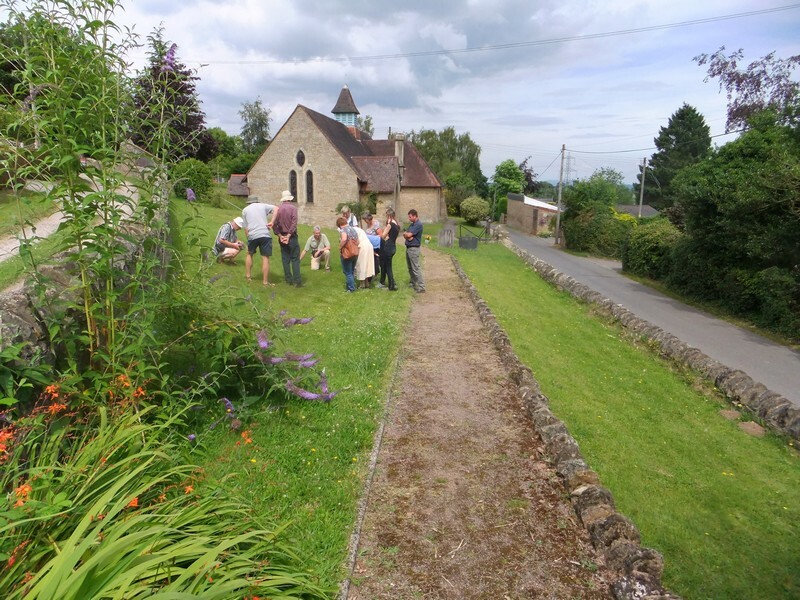 Rosie Kelsall of Dean Meadows Group ( and Gloucestershire Wildlife Trust ) gave a talk to the English Bicknor & District Garden Club about ” Dean Wildflower Meadows”.